TubeThumper - YouTube Video Views Increaser. Use our software to get more youtube video views and Youtube Channel Plays. By doing this, your video will move up the search position in YouTube Search and Google Search for your videos category. More people will see your video causing an additional of views, comments, and honos givng your promotional videos more effective power for website video marketing. Increase your website traffic. YouTube video view increaser, channel views increaser, boosts video ranking. ...... Increase your website traffic. Features include sheduling, automated proxy import, automated video list import, unlimited usage, unlimited profile usage, random agents, random delivery timing, and much more! download YouTube videos and convert them to 3GP,MP4,AVI,WMV,MOV etc. Youtube EXE is a video searcher and player software. Download, Save and Convert Youtube video clips. Acoolsoft PPT2YouTube is a powerful tool helps you upload PowerPoint to YouTube. Qweas is providing links to Tube Thumper - YouTube Views Increaser 1.0 as a courtesy, and makes no representations regarding Tube Thumper - YouTube Views Increaser or any other applications or any information related thereto. Any questions, complaints or claims regarding this application Tube Thumper - YouTube Views Increaser 1.0 must be directed to the appropriate software vendor. 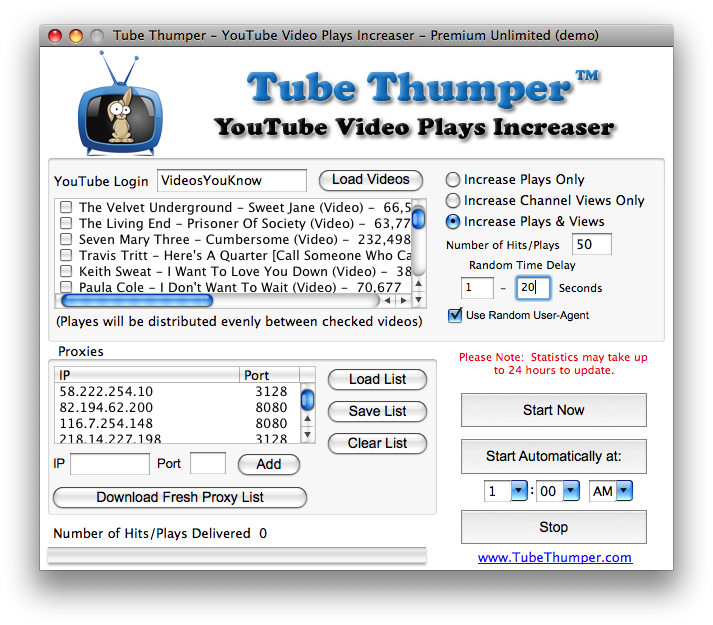 You may click the publisher link of Tube Thumper - YouTube Views Increaser on the top of this page to get more details about the vendor.